Backflow Compliance is a certified backflow prevention service company serving New Jersey and New York City. We provide backflow related services including backflow preventer testing, repairs and annual inspections. We handle the backflow testing & repair process for you from A to Z, including filing with the town and the local water authority all for one small fee. We are a certified backflow testing company that has the experience and ability to manage all sizes and models of backflow prevention assemblies that are manufactured for all types of water distribution systems. As a new client we would like to extend a get to know us offer including FREE on-site backflow prevention analysis. We’ll come to your property at NO charge and advise you as to what needs to be done with a FREE quote for any backflow testing or repair with NO commitment to use our service. We sre local NJ sewer contractor providing all types sewer repair services in NJ call us for FREE cost and estmate for drain sewer line repair and trenchless pipe repair options in New jersey. In New Jersey and New York you must conduct annual backflow testing to ensure that the backflow preventer device is working properly. We are dedicated to simplifying all your backflow prevention needs; including backflow prevention assembly testing, certification, installation, backflow repair and replacement. We will provide you with ALL the required documentation for your town or plumbing water provider for your compliance with their local backflow ordinances. Backflow testing or backflow sewer services NJ can be done usually within 30 minutes, minor repairs such as backflow preventer leaking can usually be done on the spot. All certifications by Backflow Compliance include maintenance of all backflow records and we notify all of our customers when their annual inspections are due. 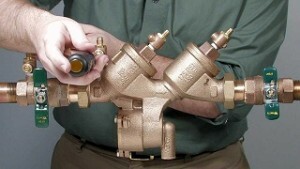 We have the most affordable backflow testing prices! In order to provide you with the best backflow testing cost we need to know some information about the backflow preventers installed in your facility. In any event we provide you with a free on-site analysis so we give you a free opinion and quote with no commitment on your end. Contact Backflow Compliance at 201-645-0888 to schedule an appointment; we will make the testing and certification process quick and on time.